These are small, yet spectacular flowering shrub, Isoplexis have flowers rise well above the foliage in spring to summer adding a little height to the garden border. With a long flowering period late spring through summer Isoplexis caneriensis really add a great splash of colour to the border. Upright apricot flower spikes that look like a foxglove. I. canariensis is a bushy evergreen shrub to 1m. Not widely grown yet well suited to our gardens, Isoplexis are from the Canary Islands and the four species all have brilliant flowers. I. caneriensis (pictured right) is readily available and the most widely grown species. I. isabelliana is a species with red flowers on a terminal flower spike.. I. sceptrum is worth searching for as it is reputed to be a more hardy variety, broader leaves and pale almost creamy flowers. This is a great shade plant, attractive flowers and good foliage. 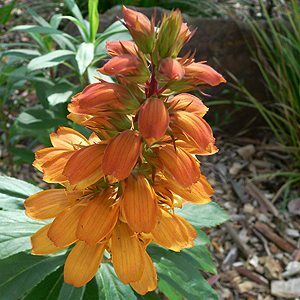 Isoplexis enjoy a humus rich well drained soil, partial shade and moist soil. Climate Zones – Warm to temperate. Height – Generally to around 1 to 1.5 metres. Spread – Will spread to .5 metres..
Foliage – Mid to Pale Green.